After working as a graphic designer and art director, Tina McCarthy decided to turn her lifelong passion for cycling into a career. 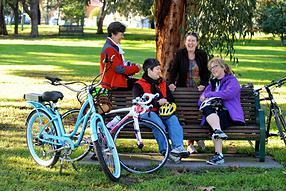 In late 2012 she started Wheel Women, which provides skills education programs and rides for non-elite women cyclists from beginner level to advanced. AustCycle based skills sessions provide riders with the confidence and know-how to be safe on their bikes, as well as educating them about improving fitness through cycling. 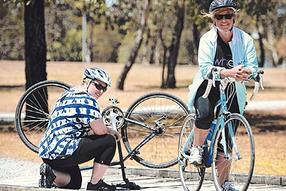 “I am passionate about cycling,” Tina says. “I can see it makes a difference to people’s lives and I wanted others to feel the benefits I have had from cycling, both physical and mental. Wheel Women organises teams in non-competitive events such as Around the Bay in a Day and supplies members with cycling apparel. Tina knew she had a great model but after unsuccessfully applying for a City of Melbourne grant, she wanted help resubmitting it. After the council offered Tina four SBMS mentoring sessions, she saw mentor Elizabeth Raut over a 10 week period. Elizabeth provided Tina with a sounding board for her very creative entrepreneurial approach to growing her business. “I helped her explore options so she could make choices and be confident about the direction she wanted to take,” Elizabeth says. Document Wheel Women model so she could replicate the program locally in other locations. Develop a job description for what she did. Consider the benefits of franchising compared to contracting staff leaders at various locations. Tina went back to her original Mind-Map and reflected on her initial thoughts about starting the business. “She realised she is not selling a product, but is selling a dream, building a community of women cyclists,” Elizabeth says. Since seeing Elizabeth, Tina has improved her idea management and been better able to break tasks down. Elizabeth also helped pinpoint her strengths so she could focus on those rather than dwell on weaknesses. Tina has continued to use the social media platform for advertising and to pick up leads for new customers from this. Profitability has not improved yet but Elizabeth says there is great potential for it to do so. Tina was extremely pleased with Elizabeth’s advice. “The help I received from my mentor has been EXCELLENT as it has provided a sounding board and tips on gaining direction and focus,” she says. Without Elizabeth’s help, Tina says she would not have resubmitted for the grant. “I would not have been able to have a sounding board which helped me think about the bigger picture of where the business is going and what it should be,” she says. Tina is now confident she can grow her business while providing a unique service. “I would not have understood this whole ‘circle’ of growth had it not been for Elizabeth helping to break it down into a simpler picture for me,” she says. 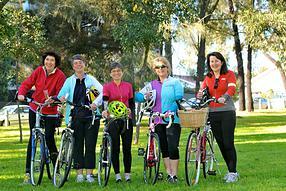 “Wheel Women is the only group of its kind which provides education about cycling to adult women and provides ongoing participation for riders to be involved in. The edge we have over others in the market is that we are at a non-elite level, so the everyday cyclist can find a place with us.